The Royal Bank Building on Main Street in Moncton was designed by J. C. Dumaresq and built in 1898-1899 by James Reid & Son, the pink sandstone from a nearby Sackville quarry still retains some of the original tool marks. Extensive Roman arch openings, paired window fenestration, pillars and pilasters all exemplify the intended style of the structure. The corner orientation of the bank’s main entrance is indicative of the merchant bank style of this era, intending to capitalize on client traffic from two intersecting streets instead of just one. An extension to the north side of the building by Ambrose Wheeler in 1929 reflects the major elements of the original structure. This building was also designated for its importance in the financial development of Moncton. 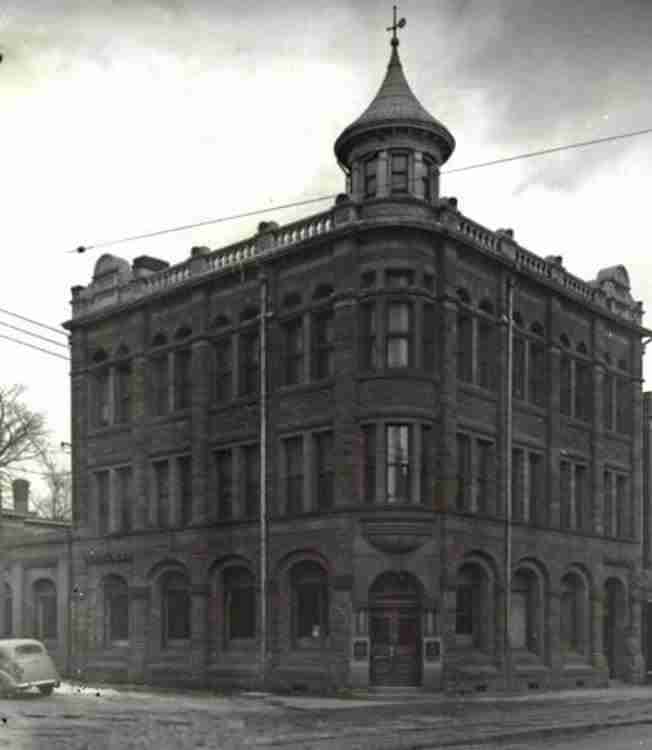 The Royal Bank of Canada began as the Merchants Bank of Halifax in 1864. It was founded by a small group of Maritime trade merchants as a private, unchartered commercial bank that would assist them in their daily business activities. It wasn’t until after Confederation, in 1869, that the bank received its official federal charter and became a public company (with an initial capital of $300,000). From there, the bank grew rapidly in the Maritime region, opening offices throughout Nova Scotia, New Brunswick and Prince Edward Island. The Moncton building remained a branch of the Royal Bank of Canada until 1986. Along with its major financial tenants, the Royal Bank Building’s upper floors have been occupied by significant local businesses such as the noted law firms of former Moncton Mayor E. A. Reilly and those of R. W. Hewson, who remained at this location for almost 65 years. As well, organizations such as the Masons and the Independent Order of Odd-Fellows have occupied the upper floors. In 1996, the Royal Bank Building was designated a Heritage Property through the City of Moncton Heritage Preservation By-Law. This post has already been read 542 times!